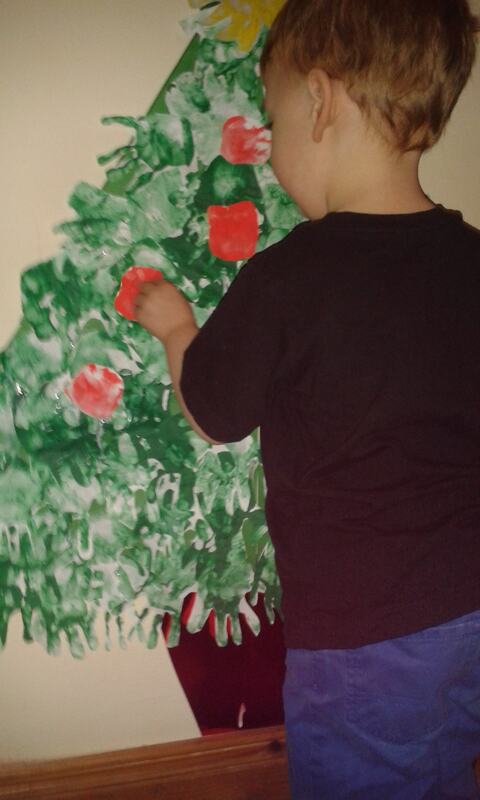 This week we got to making a large handprint Christmas tree in our dinning room area. Now we are going to share how we did it with you. This would also be a perfect advent calender for young children and toddlers. 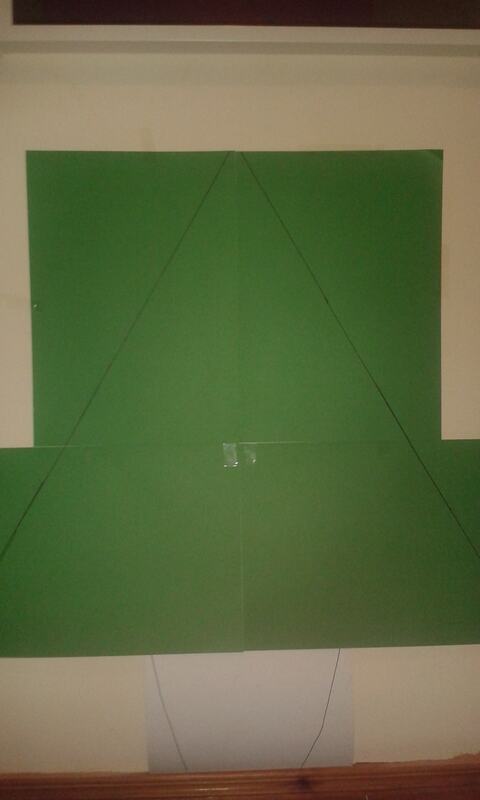 The first step is to attach the 4 sheets of green card to a wall and to draw a general triangle tree shape on the green card. I used a sharpie to do this but a normal pencil would be fine. I also added the red card and drew a pot shape on. 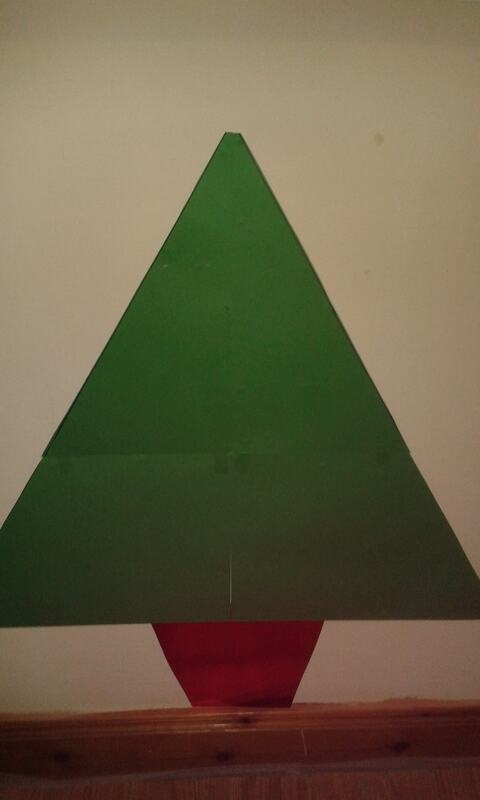 Once I had the general outline I got to cutting out each piece and sticking it to the wall with blue tac as it is easier to add the handprints when you can see the whole shape of the tree. We made our tree pretty big to fill the space on the wall. Your tree can be smaller if you like. Now that you have a tree shape it is time to get the messy mat down. You can use paper plates like we did to add the paint. 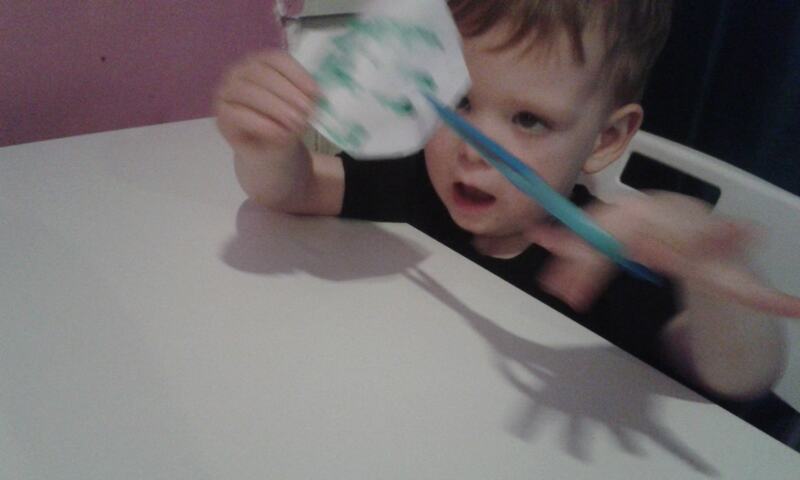 I find it is easier for D to just stick his hand in the paint if it is on a paper plate rather than a tub or tray. 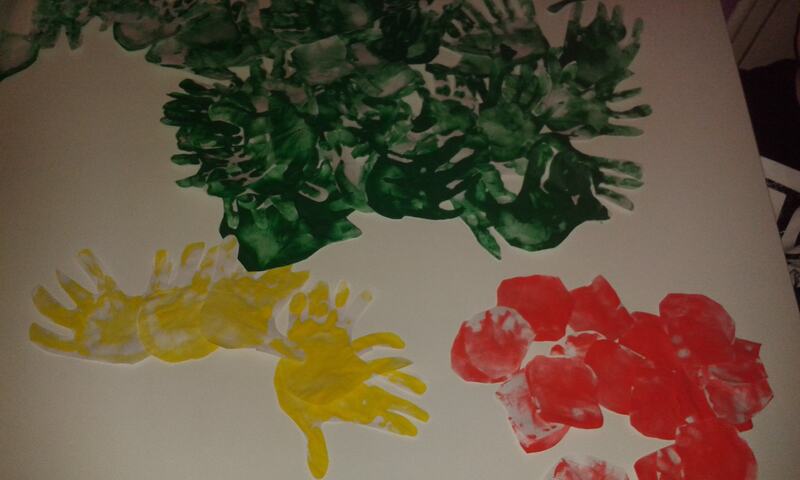 We made 10 A3 sheets of handprints but in the end we needed more and used around 15 sheets to cover our tree. D really loves squelshing the paint between his fingers! You will need to make at least 5 yellow handprints and 25 palm prints in red or another colour for baubles on the tree. If you are doing the advent tree you will need 25 or more if you would like a few extras. Now that you have all your handprint and palm prints cut out it is time to get sticking. We started out using a glue stick however this was drying faster than D could attach his hand prints and losing it's stickyness so we ended up switching to PVA glue instead and this worked much better! After we had all of the green handprints attached to our tree in the way D liked (He is very picky!) we set about attaching our yellow handprints in a circle to each other. This is our star for the top of the tree. It doesn't look very much like a star though. We attached the star to the top of the tree with a semi circle of PVA glue. Finally we attached our red palm prints to the tree which seemed to be D's element! He loved to look carefully and choose just the right spot for each one We used glue to add ours but if you are making an advent Christmas tree you can attach blu tac to each bauble and stick them on the wall around the tree ready for the 1st of December! 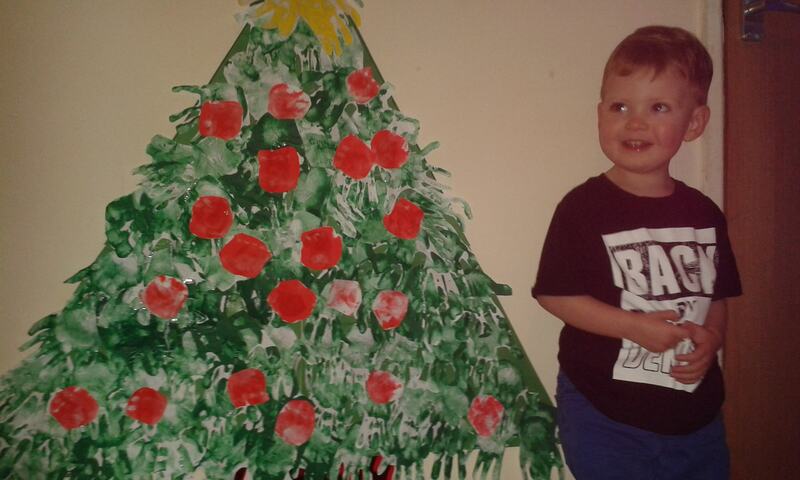 Here is one very proud D and our handprint Christmas Tree! Our second activity this week was our picture Christmas baubles! We all very much enjoyed making these to our own likes. To get started we chose where on the picture we would like to go inside the baubles. We drew with a sharpie pen around the place we wanted the bauble to be. 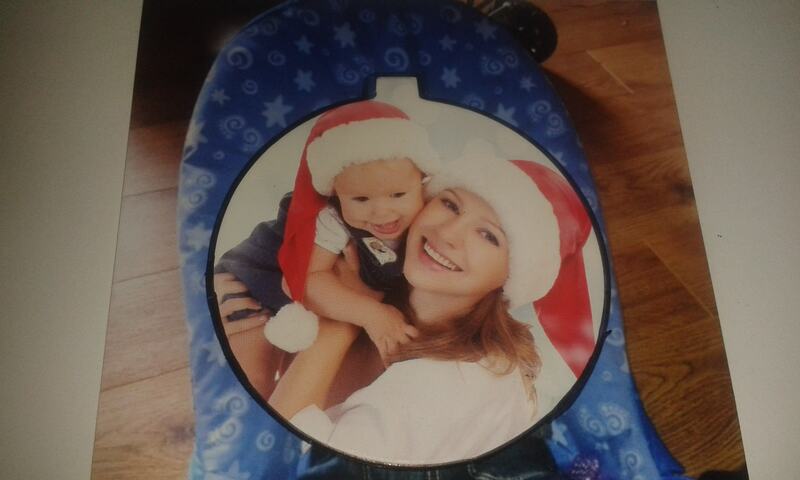 We used the picture that came with the baubles which we got in B and M for 2.99 per 4 pack as a guideline. Simon somehow managed to draw on the table! I was not pleased to say the least. After we had our out line to follow we set to cutting out the shape of our bauble which we drew onto our picture. we used the inside line as our guide. 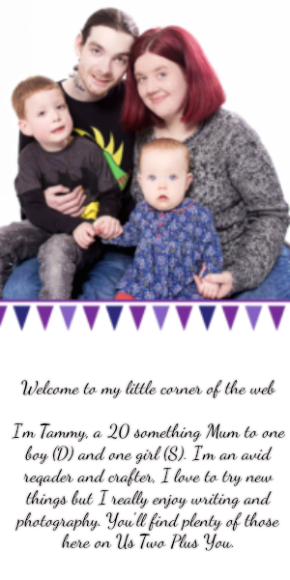 Now that we had the picture which was going on the inside we had to add some extra bits. So we added in everything we could think of with the first being sequin/confetti stars. 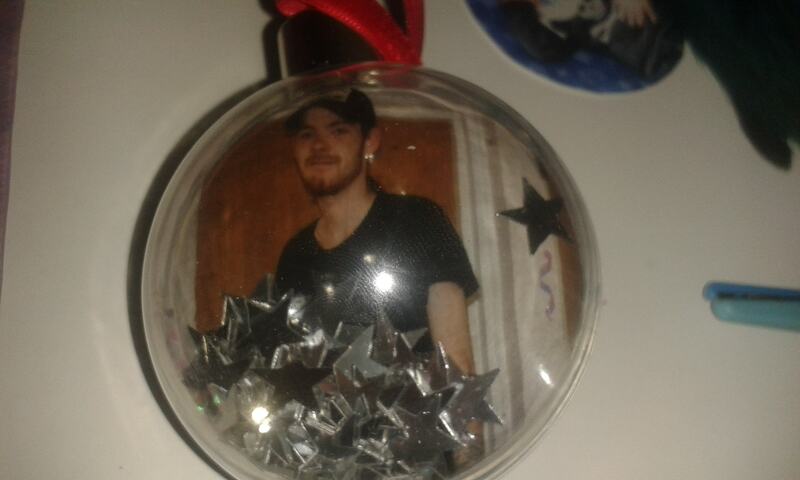 I think D likes stars as he wanted to add the whole bag into one bauble! We also added in some irridecent scatter to the back part of the bauble where there was no photo. We attached the two pieces back together and added the top part before hanging on the tree. We finally set about finishing the other baubles and adding in all sorts of bits we liked! We all got to show our own personalities by what we added to our baubles. 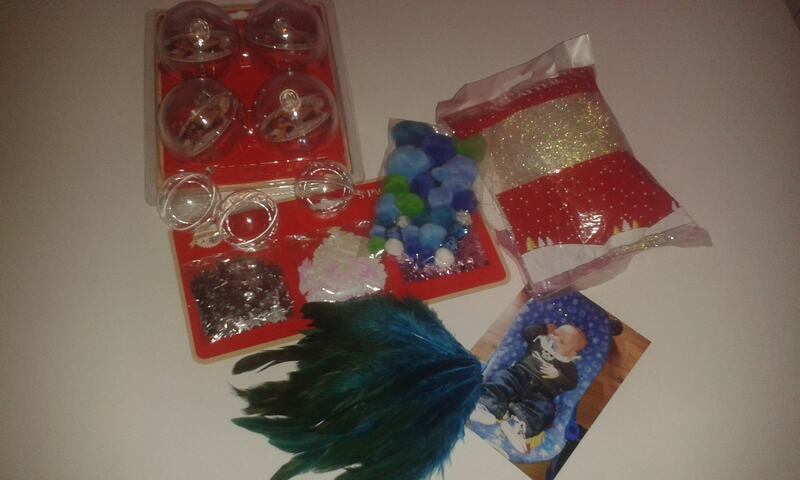 We also made some other baubles which I had bough online for around 50p each. You will be able to get these in alot of craft stores. They seem to be popular. Inside these we mostly added pom poms along with other pieces of everything. 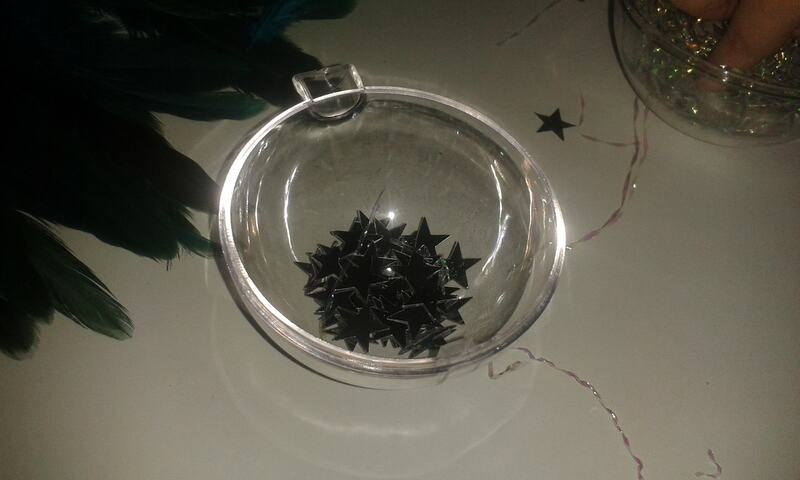 Inside one filled with feather pieces D added more stars and some googly eyes for good measure. We attached both sides back together and added some string to hang them on the tree. In the end we had made 7 new baubles for the tree and We had all spent some wonderful time together enjoying 2 great activities! Here is a gallery of all our baubles on the tree. 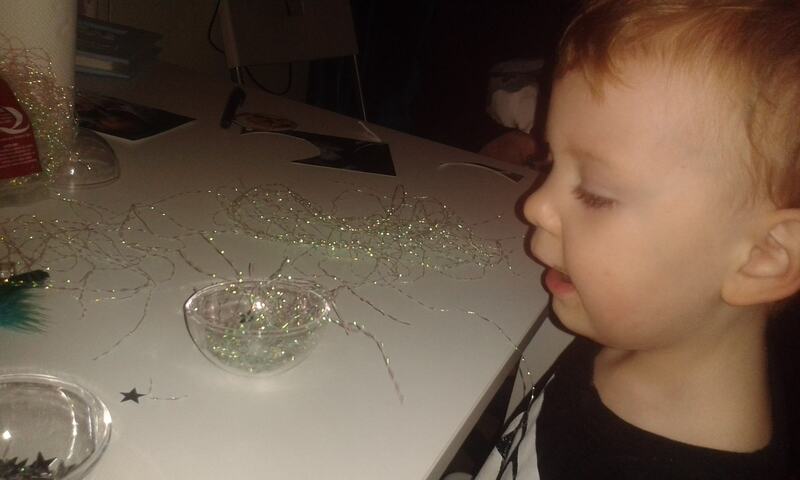 I hope you enjoy making your own baubles and handprint Christmas trees! Thank you. It's quite fun too!